DreamWorks has been trying to stake its claim over the past few years as the "other" big animation studio with varied results. In 2001, Shrek was a terrific success story, as the CGI ogre and his donkey friend deconstructed classic fairy tales and captured the hearts and wallets of movie audiences along the way. CGI animated films saw an explosion of growth over the months that followed, with Monsters, Inc., Jimmy Neutron: Boy Genius and Ice Age all proving to be solid audience draws. Rather than follow up their greatest animated triumph with another CGI production, DreamWorks instead took the rather risky approach of going back to traditional animation for Spirit: Stallion of the Cimarron, though they did wind up using some CG techniques to render some of the backgrounds. Adding to the uncertainty regarding the film’s box office prospects was the fact that the film used a unique approach to tell its story. None of the animal characters spoke, so music and sporadic narration from Matt Damon had to move the plot along. Nonetheless, Spirit was fairly successful relative to the lowered expectations of both the studio and prognosticators. 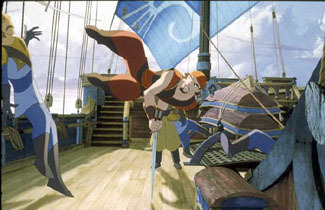 Like Spirit, Sinbad will be “tradigitally” animated for a blend of classic-style animation with stunning backgrounds. The character of Sinbad originally comes from the book Arabian Nights, which relates the details of his seven voyages. Though it’s unclear how much the film will draw from the legend, the story itself looks to be almost a combination of the recent animated tales of Aladdin and Hercules, as current character descriptions would seem to indicate that mythological figures from both Persia and Greece are present. Since there is only minimal information about the true plot of the film available at this point, it’s entirely possible that the story will take an entirely different direction. DreamWorks SKG co-principal Jeffrey Katzenberg has compared the tone that of Indiana Jones, saying that Sinbad will be a sophisticated tale of gods and monsters, with drama, action and romance all coming into play. An all-star cast will provide the voices for the variegated characters, including Brad Pitt as Sinbad and Catherine Zeta-Jones as the hero’s love interest, Marina. The other two featured roles are Eris, Greek goddess of chaos, and Proteus, the Greek god who protected Poseidon’s seals. Michelle Pfeiffer and Joseph Fiennes are the actors behind these animated personas.